A dog in the village begins to bay. But then commences to whine. Is that a wind scratching the dry grass? Or is something shuffling out there in the darkness? Disturbed from sleep, the villagers throw open their shutters and peer at the gloom. Who can see? What is there? Nothing. No, nothing. And then, the filthy clouds part, and the moon leers over the fields north of the town. The land is strange and alive, like a corpse is alive with worms. The dead have risen! The Lichemaster has come to Frugelhofen! Our parade through The Terror of the Lichemaster continues. Last week, we looked at the heroes of Frugelhofen. Today, I want to look at those whom they will be leading -- the rank-and-file villagers. 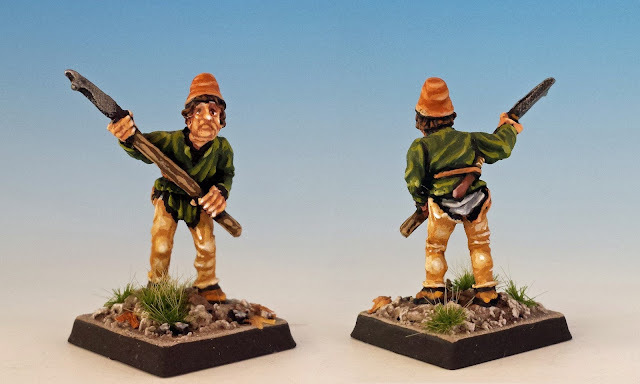 As with Gimbrin's dwarves, there are no "official" miniatures for this militia, so the hobbyist is left to his own devices. I decided that I wanted to make the militiamen as pathetic as possible. Rather than stout soldiers, I thought the drama of the final battle would be heightened if these villagers were old, lame and inept. Fortunately, Citadel is well supplied with old, lame and inept townsfolk. 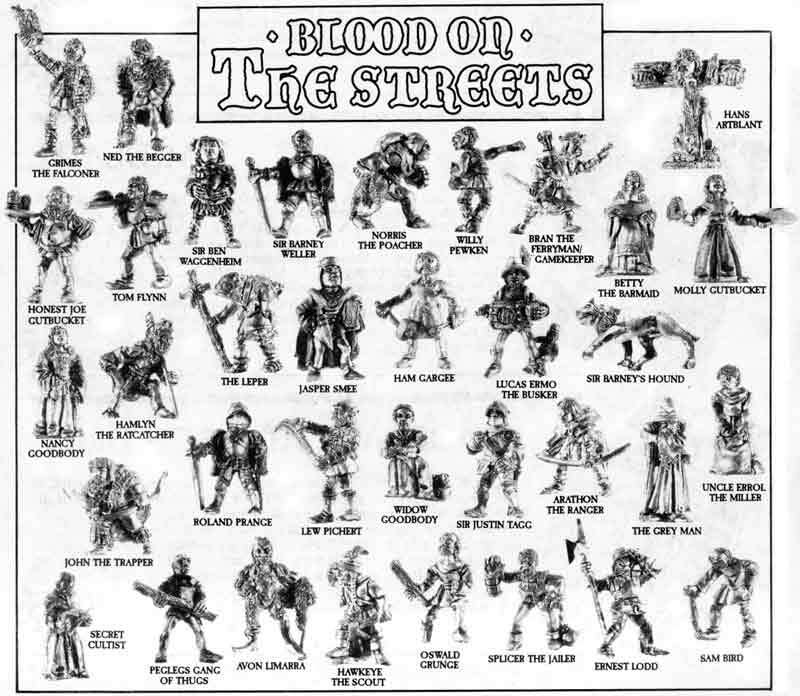 I was especially drawn to the miniatures sculpted -- chiefly by Trish Morrison -- for the Blood on the Streets scenario pack (1985). Trish Morrison gets mixed reveiws as a sculptor, but these miniatures show how even her weaknesses can be strengths. Her penchant for odd proportions and unlovely faces is perfect when you want a mob of villagers who look inbred. 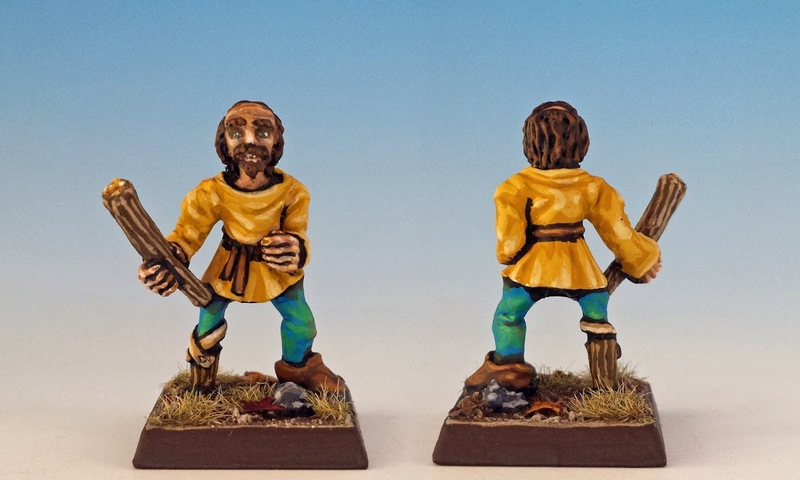 This is "Ned the Beggar" from the Blood on the Streets range and from C46 Villagers and Townsfolk (1985, sculpted by Trish Morrison). Barefoot, bandaged and be-crutched, he's ready to take on the Old World's most diabolic necromancer. The only thing more pathetic than a beggar is a leper. So here's "The Leper" from Blood on the Streets and C46 Villagers and Townsfolk (1985, sculpted by Trish Morrison). In the Blood on the Streets campaign book (written Andrew "Pank" Szczepankiewicz), the Leper is described as a "Breton noble who fell foul of a wizard, and was cursed by leprosy as a result... his sole valuable is a gold ring with which he will never part... this ring is the source of his affliction, and... causes leprosy to anyone who holds it." Our cavalcade of champions continues with Oswald "Pegleg" Grunge. He is also from Blood on the Streets and C46 Villagers and Townsfolk (1985, sculpted by Trish Morrison). Nice comb-over, Oswald. Here we have an unnamed member of Citadel's C46 Militia (1987). I transformed this miniature into a gravedigger (graverobber?) by giving him a spade and a pet rat. The club comes in handy if the body is not quite dead. 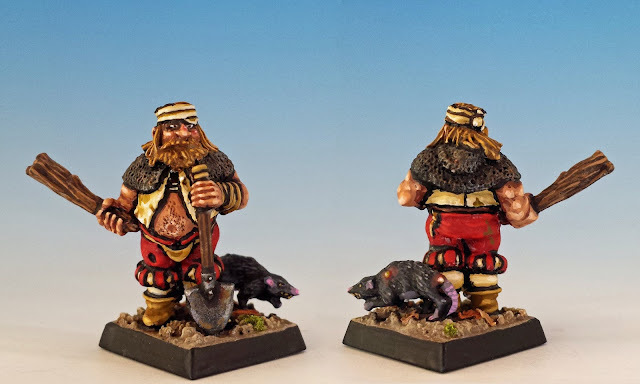 This is one of Wargames Foundry's "Ex Citadel" miniatures from their MED125 figure pack. Originally he was sculpted by Michael and Alan Perry and released by Citadel in 1984. Foundry's Ex Citadel range is a great way of getting certain old sculps without the hassel and expense of trawling through eBay. It's especially useful for filling in some gaps in the Blood on the Streets range or finding old C01 Fighters, C26 Men at Arms and C37/C38 Medieval Adventurers. Why hello there, it's Ian Livingstone, co-founder of Games Workshop, author of innumerable Fighting Fantasy books and first editor of White Dwarf Magazine. How do we know? 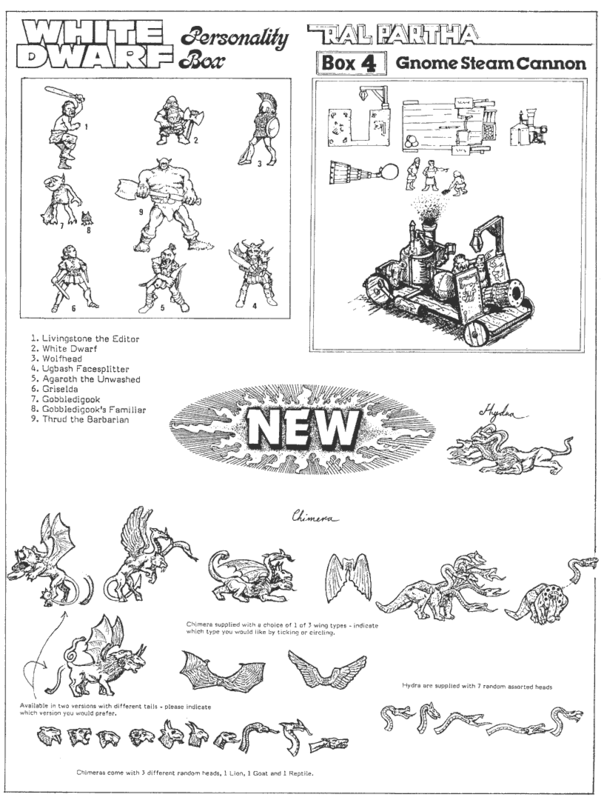 Well, the miniature is called "Livingstone the Editor" and he comes from the White Dwarf Personality Box (1984). He's a wonderful preslotta sculpture... a dynamic posture, lots of character and fine details (I mean, look at that mustache!). 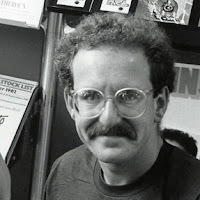 And after dealing with the crew at Games Workshop, I'm sure that a horde of zombies will be a nice change for Ian. Next week, we'll continue our inspection of the villager militia by turning to the archers of Frugelhofen. Lovely stuff!Personally I have always preferred militia units to elites in my armies. I find them fun to fight with and an interesting challenge to win with.Be it Danish militia in clogs from 1807 or medieval night watch. I look forward to reading more. Thanks for stopping by, Tradgardmastare. I agree about the militia units. There's always more flavour in the cheaper cuts of meat. 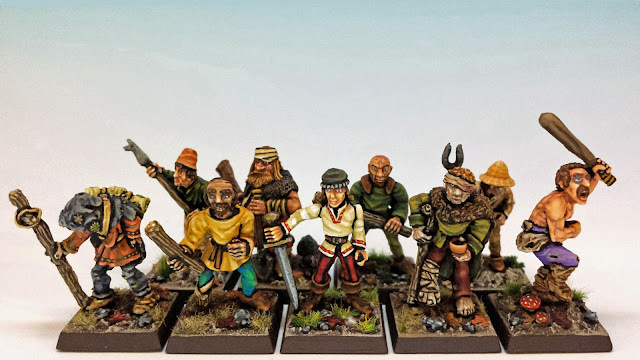 They look superb, great details and poses...my favourite is "Ned the Beggar"...Fantastic! Thanks Phil - I think Ned is also my favourite. I spent a lot of time trying to make him look as unhealthy and unhygienic as possible. Really nice painting job... even if Trish's miniatures are definitely not my cup of tea. One think you can certainly say about Trish Morrison's sculpts is that they're distinctive. You're being polite :) That being said, I love your systematic approach to collect and paint every model, even the ugliest ones! Wowzers! 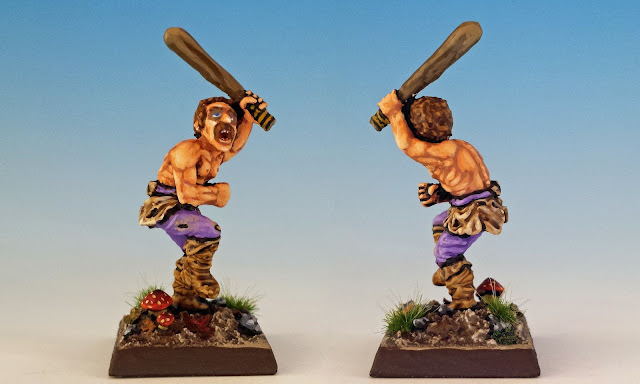 Fantastic Paint jobs that seem to jump off the screen! Well done. Cheers Blue. I always appreciate your feedback. Each post gets better and better! These guys look so pitiful. Will they hold? That's a very nice thing to say. Thanks! (And no... I don't think they'll hold). I'm glad you approve, JB! Wow, there are some really interesting sculpts I had never heard of. Absolutely magnificent work!! They're a great range of miniatures. Lots of personality. Amazing! You've made these models look really good! They'd be perfect for a DCC funnel game. That's a great idea... I hadn't considered DCC before. Thanks! Your choice of miniatures, little conversions and lovely painting really do create a heady mix of excellence. I remain jealous of your work and projects! Right back at you, SB! Yes -- they're not really grimdark. More grimdirt. 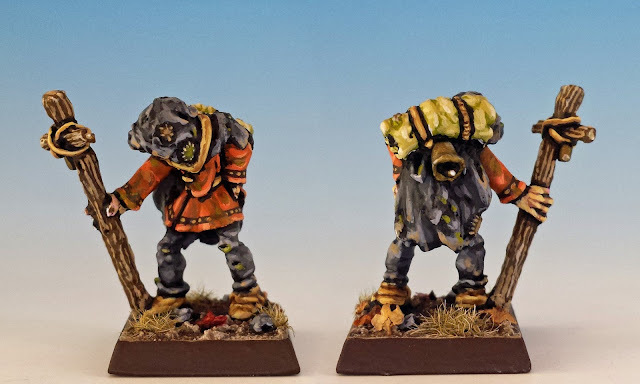 Some of these chaps look half way en route to being the shambling dead. Maybe that will sow confusion in the Lichmaster's ranks and allow the militia to get in close and strike first? I was struck by how lovely your basing work is. Pet rats, mushrooms, little tufts of grass - adds so much to these figures. Lovely. I'm glad you like the bases, MP. I used to make my own toadstools out of greenstuff, but I recently found some great pre-made mushrooms from "Ristul's Market". Ristuls makes good stuff. Awesome selection of classic minis and beautiful painting as always. 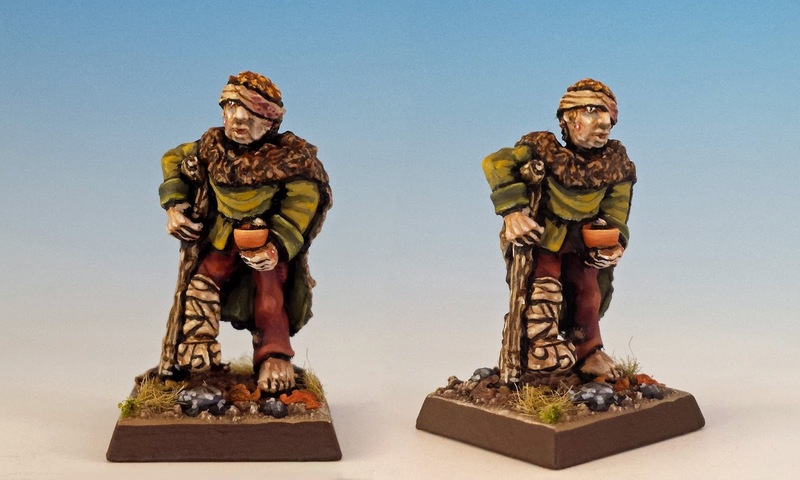 Ned the Beggar and the leper look like they're ready to go over to the Lichemaster at any moment. I will have to check out Ristul's Market. I've been admiring yuor bases for quite some time. Like M.P. says, they add so much! Ristul's market is great. I think its based in Poland. Anyway, they have some great stuff for conversions. Check out the "mutant heads". These are just wonderful! I love this project so much. Thanks Sean. Hopefully someday I can put this on during an Oldhammer in America meet up. Everyone's said what I wanted to already before me.